The new head of the University of Washington School of Law is a former prosecutor who learned from personal experience how using social identity in a court of law can have long-lasting effects on defendants. In the mid-1990s, a young prosecutor tried to sway a jury as it sentenced a man found guilty of domestic violence. It was a tough case for Mario Barnes, decades before he was to become dean of the University of Washington’s law school. The survivor had recanted her testimony, although the facts were not in dispute. In his prosecution, Barnes described the defendant, an African-American man, in harsh terms. Years later, Barnes — who is himself African American — regretted portraying the man as a hopeless case. A Navy lawyer by training, he went on to research how using social identities like race, gender and class in prosecutions can have long-lasting effects on a defendant and his or her community. 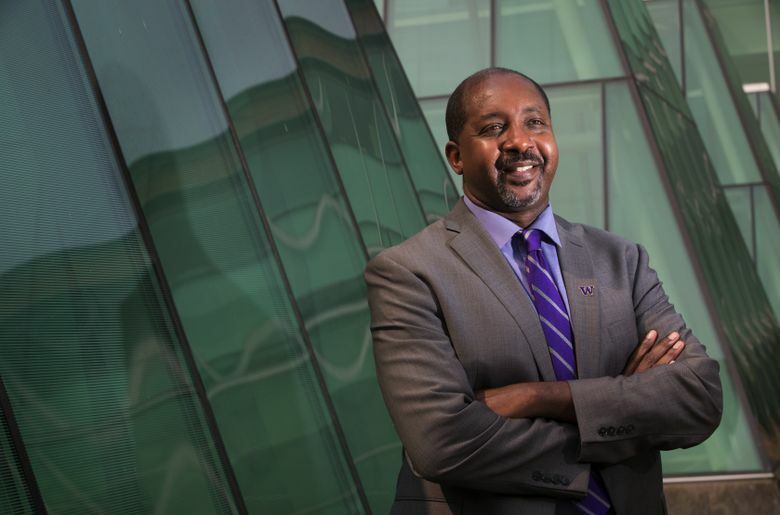 That record of scholarship and research is one of the reasons why a UW search committee chose Barnes to be the school’s next law-school dean. Barnes comes to the UW as law schools emerge from a nearly decade-old slump. After the start of the Great Recession, law-school applications declined while tuition soared. Many smart students pivoted to computer science and other tech fields. Now, with lawyers in the spotlight in many of the nation’s major political fights, the lure of a law degree is starting to tick up, and schools are seeing a rise in applications. Barnes is the UW’s second African-American law-school dean. Still, despite its commitment to diversity, the school has struggled to get more underrepresented minorities into the profession. Only six African Americans graduated from the UW law school in 2017, making up 3 percent of the graduating class of 177 students. Hispanic/Latino graduates made up about 10 percent of the graduating class. Just one graduate was Native American. Barnes uses his whole body when he talks — throwing his arms outward as he expands an idea, or resting his hands on the table firmly to press home a point. He’s funny and self-deprecating, with a big personality. When he visited the UW campus as one of four finalists for the position, law-school students who met him were so impressed that they started a writing campaign to try to get the search committee to pick him, search committee head Sullivan said. Similarly, UW law professor Kathryn Watts, who served on the law-dean search committee, said she thought the school was lucky to get him on board. Barnes attributes the slight resurgence in law-school applications over the last two years to the effect of shifting political winds, of “contested and excited politics,” as he describes it. The UW’s School of Law is one of just three in the state; it is both the largest and the only public law school in Washington. (Seattle University and Gonzaga University, both private Jesuit universities, also have law schools.) One of Barnes’ most important roles will be fundraiser-in-chief, to help students who can’t afford the $100,000 overall price tag, in tuition and fees over three years, for a UW law degree (and more for out-of-state students). Those were the days when state support paid a much larger portion of the cost of a college education. When Barnes was in college in the late 1980s, undergraduate tuition and fees at UC Berkeley was $1,296 a year. Its law school, which he later attended, cost $4,800 a year. Today, in-state UC Berkeley undergrads pay about $13,000 a year in tuition and fees, and law-school students pay $44,000 a year. The prices have similarly gone up in Washington, for the same reason — cuts in state support. For an academic, Barnes, 49, has an unusual background. He came to the law by way of the Navy, after getting his undergraduate degree through a Naval ROTC scholarship. He served for 12½ years as a Navy officer and lawyer, and was on the commission that investigated the 2000 bombing of the USS Cole in Yemen. He spent an additional 11 years in the Navy reserve while also working as a law professor — first at the University of Miami then at the University of California, Irvine. The middle child in a family of six, Barnes grew up in San Diego and went to school at the University of California, Berkeley. On the famously liberal campus, the epicenter of anti-war protests a little more than a decade earlier, Barnes and other ROTC recruits drew unwanted attention with their uniforms. Barnes learned to shrug it off. After graduation, Barnes was a naval surface-warfare officer, and one of his duties was to be his ship’s legal officer, working with Navy lawyers on legal issues. Curious about the role of a lawyer in the Navy, he peppered the attorneys with questions. The Navy later sent him to earn a law degree at Berkeley. After law school he was assigned to Guam, where he sometimes worked with the U.S. Attorney’s Office. That’s how he came to be prosecuting that crucial, tricky domestic-violence case in the mid-1990s. Later, he received his master of laws degree — an advanced certification in the law — at the University of Wisconsin at Madison. Edwin Chemerinsky, the dean of the UC Berkeley School of Law, sought out and hired Barnes to be a professor there when he founded UC Irvine’s law school. Barnes is a “terrific teacher, a wonderful scholar, and a great colleague,” he said via email. Watts, the UW law professor who served on the search committee, described Barnes as bringing with him “the perfect combination for UW Law — a proven track record as a leader, a serious scholar, and a proponent of the value of public institutions.” In 2015, The National Jurist magazine named him as one of 20 national leaders in furthering diversity efforts in legal education. As he came to teach, study and write about identity, crime and justice, Barnes sometimes thought back to the man in the courtroom in Guam, and how he unconsciously used the man’s race as part of his case. And then, there was a misaligned incentive he discovered through experience: Prosecutors, Barnes said, are measured by their success in the courtroom, not in how empathetic they are toward the defendant. His research studied how prosecutors often use coded language in the courtroom to try to subtly influence the jury and win cases — and that the language has long-lasting effects on the defendants. That’s a lesson he tries to impart to law students.